Thank you to my friend, Sylvia Grossberg, for this. Here's a new airline for pets: "Welcome to Pet Airways, a pet-only airline dedicated to pet-friendly travel. 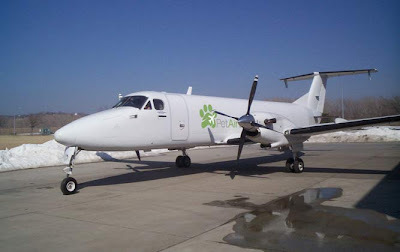 With Pet Airways, your pet will be safe and comfortable flying in the main cabin --- not in cargo! Give your pet a first-class travel experience today!" This is legit.....I kid you not! How wonderful! My "Wallis" (jack russell) would terrorize the aircraft and destroy everything in sight but my sweet little "Chips" would, I think, be quite delighted to fly. How about your "kids"? The animals depart from pet lounges and there are even air hostesses! The rates are reasonably reasonable ($149-$299).